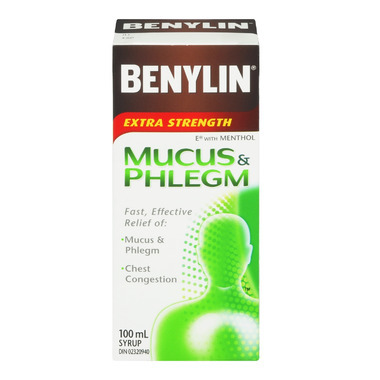 Benylin Extra Strength Mucus and Phlegm Relief works in your lungs to break up tough mucous and phelgm, and has an expectorant to clear it from your chest. This extra strength fast-acting offering is specially formulated to loosen and thin out mucous and phlegm so that you can expel it when you cough. Medicinal Ingredients: Guaifenesin (200 mg/5 mL), Menthol (15 mg/5 mL). Non-Medicinal Ingredients: Alcohol, citric acid, FD&C Blue No. 1, FD&C Red No. 40, flavour, glycerin, monoammonium glycyrrhizinate, polyethylene glycol, polyoxyl hydrogenated castor oil, propylene glycol, saccharin sodium, sodium benzoate, sodium chloride, sodium citrate, water, xanthan gum. Caloric content: 5.7 Kcal/5 mL. CAUTION: Consult a healthcare practitioner before use with other medications, including natural health products, prescription drugs, or nonprescription drugs. Talk to a doctor before using this product if you have asthma, chronic lung disease/shortness of breath, persistent/chronic cough, or are pregnant, breastfeeding, or taking a drug for depression, including monoamine oxidase (MAO) inhibitor drugs. Check with a doctor if cough worsens, lasts more than 7 days, or tends to recur, if sore throat pain persists for more than 2 days, or if you also have excessive secretions or fever. Do not take more than the recommended dosage. Overdose may result in serious harm. Do not use if you are allergic to any of the ingredients. Discontinue if allergic reactions such as wheezing, rash or itching develop. I don't like the taste of this product. May or not buy again.